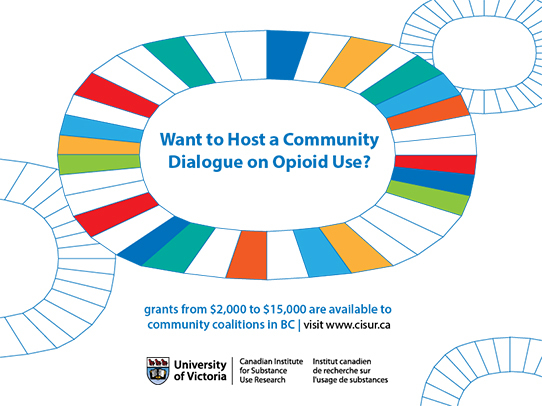 The BC Ministry of Public Safety & Solicitor General has provided a second phase of funding to the University of Victoria’s Canadian Institute for Substance Use Research (CISUR, formerly CARBC) to support community dialogues in response to the opioid overdose crisis in British Columbia. Coalitions from First Nations and other communities in every region of the province are invited to submit a letter of interest in engaging their community in dialogue about opioid and other drug use. CISUR will provide selected communities with grants ranging from $2,000 to $15,000 to assist with costs associated with hosting community dialogues.